Relatives of mine once lived in the antebellum homes that grace Bay Street in downtown Beaufort, South Carolina. Often, they would tell the story of how their family home was once occupied by Union troops: "Here, look at these old photographs that show Yankee soldiers sitting on our front porch." The necessity of why Union troops arrived in the South was never mentioned, nor was the history that unfolded just ten miles distant. Recently, I drove past Bay Street and traveled to an area now known as Penn Center. I stopped at the oldest building on campus, the Brick Church, and met Pastor Abraham Murray. 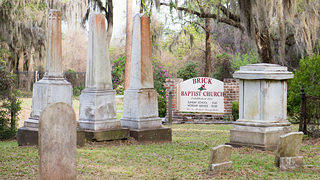 “The arrival of Union troops can best be described in Biblical terms,” Pastor Murray offered. “For many years slaves had toiled on the plantations dreaming of the day that Moses would tell them, ‘You’re free.’ In 1861, when Union troops captured nearby Port Royal and the plantation owners fled to the mainland, that day arrived. But what next? Darrah Hall at Penn Center. Penn Center is not listed on the National Landmark of Historic Places for its architecture, but rather for its contributions to black history and social justice. After the battle of Port Royal, the Union Army allowed the now-free men and women at least temporary possession of the abandoned land. Northern businessmen then paid the blacks to farm the cotton. The workers earned $1.00 for every 400 pounds produced. In April of 1862, the Port Royal Relief Committee of Philadelphia sent Unitarian missionary Laura Matilda Towne and her Quaker friend Ellen Murray with enough funds to establish the Penn School. 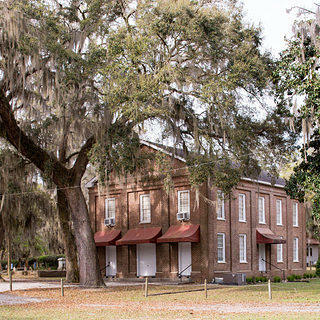 Initially located in a room of the Oaks Plantation House, the school soon moved to the Brick Church in order to accommodate large numbers of students. In 1864, Hasting Gantt, a black man, donated land for a permanent school. The death of President Abraham Lincoln in April 1865 marked a decline of interest in the Port Royal Experiment. Lincoln’s successor Andrew Johnson and local politicians eventually restored much of St. Helena’s lands to their previous white owners. This might have been the end of Penn Center, except for the determination of Laura Matilda Towne. "The significance of the Penn School in relation to the history of black education is threefold. First, the Penn School can lay claim to being the first school established in the South as a result of the Civil War for the formal education of Negroes." photo by: Penn Center, Inc.
Courtney Siceloff (right of MLK in the photograph) was the first executive director of the Penn Center on St. Helena Island from 1950 to 1969. 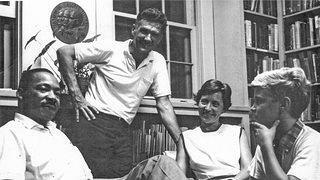 He and his wife, Elizabeth (in photo) were Quakers who spent their entire lives pushing for social justice. Second, the Penn School is a model of a type of elementary-secondary school established by Northern religious and philanthropic organizations for educating the freedmen. The example of Northern teachers going South and establishing private schools supported by religious groups and the Freedmen's Bureau was followed throughout the South. Third, the Penn School was an excellent example of the influence of the Hampton-Tuskegee approach to black education. Under Laura Towne's leadership, Penn School developed a vocational program, but the school also stressed the traditional, "literary" curriculum. 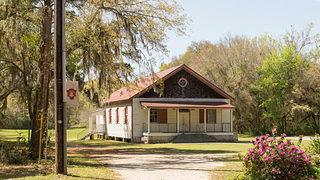 Penn Center School closed in 1948 when the state assumed responsibility for public education on St. Helena Island. In response, Penn Center refocused its mission and became a local community resource. The Penn Center story continued into the mid-1960s when the secluded setting became a favored destination of Dr. Martin Luther King Jr., his Southern Christian Leadership Conference, and white activists. According to his biographer, it was one of the few places in the country where he could relax and plan with members of both races. 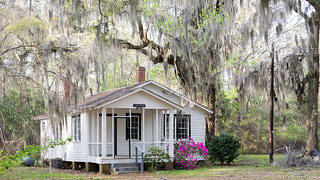 Praise houses, such as the Mary Jenkins Praise House, were first established on St. Helena plantations in the antebellum period, as enslaved people used small frame houses or other buildings as places to meet and worship. 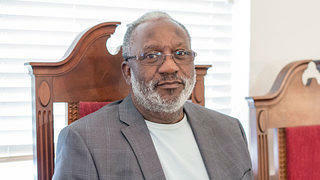 Pastor Abraham Murray has served the Brick Church and local community for over fifteen years. 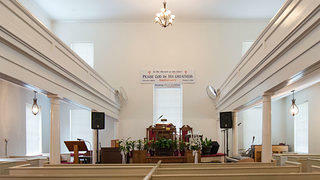 Prior to the arrival of Union troop in 1861, white people sat in the pews, enslaved people in the gallery. By virtue of the sharp angles, white people could not see the slaves, even if they were standing. The Gantt Cottage at Penn Center. 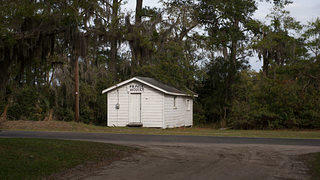 The remote nature of St. Helena Island allowed both black and white Civil Rights leaders to meet and plan in relative peace. I asked Pastor Murray about the current state of the Brick Church. “The building or the congregation?” he said. “Unfortunately, we are making plans to move. The foundation, due to its original construction on sandy soil, is no longer stable. It is our intentions to have the church restored. It will continued to be used for certain worship services and gathering—Church anniversary, Church reunions, Watch Night Services, etc. As far as the congregation, my current efforts are focused on relationships. We need to reconnect with each other, re-establish family relationships, just like we did in the era of the Praise Houses. The historical photograph in the slideshow above is from the Penn Center History, Arts and Culture department and Penn School Collection at the UNC-Chapel Hill Wilson Library. Permission granted by Penn Center, Inc., St. Helena Island, South Carolina.